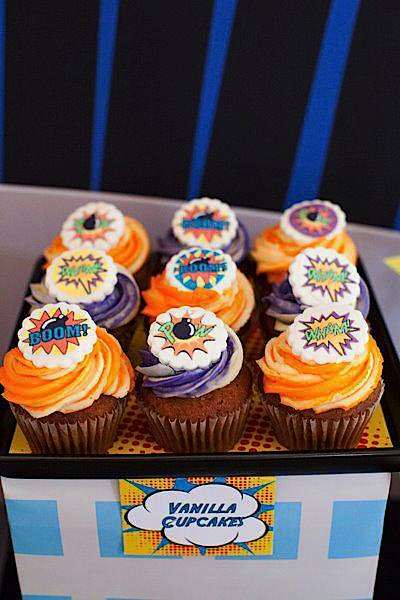 This fun SUPERHERO THEMED BIRTHDAY PARTY was submitted by Dalia of Tiny Tots Toy Hire. This party was actually a combined girl boy party- combined with a sweet shoppe party that will be showcased next. 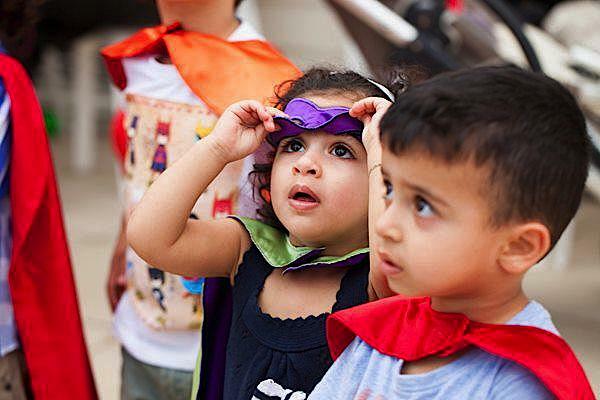 “With the birthday kids being a four year old boy and two year old girl, the props used to theme and style the Calling all Superheroes: Help Save the Milk Bar! birthday party were perfectly tailored for both sexes. 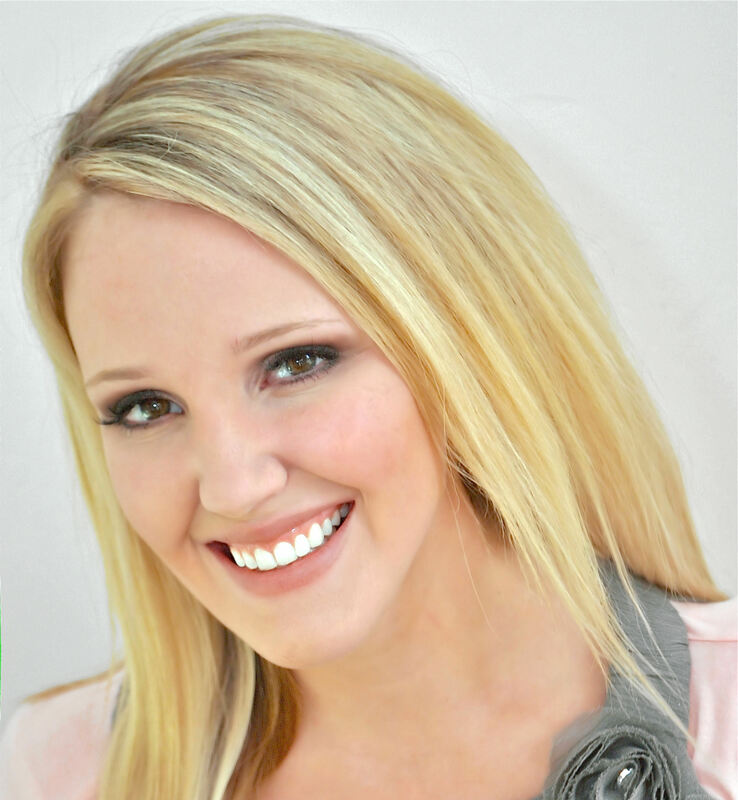 We wanted to show that boys and girls parties can be combined successfully and still look amazing and be lots of fun. It just takes a little creativity and thinking outside the box! We had a blast styling our new prop and printables range to appeal to all the little guests, with the custom made vintage style phone booth an absolute hit even with the adults! Hire props on the beautifully decorated Retro Milk Bar style dessert table (styled by Sophisticated Yum) included a mini retro style juke box, a gumball machine and various glass jars and cake stands filled to the brim with sweet treats, all sitting on a back and white checkered floor. Yummy goodies included macarons, sundae push pops, home style melting moments and choc chip cookies, cake pops and lots more! Not so far away from the Retro Milk Bar was a thirst quenching lemonade cart with a glass beverage dispenser, and a melt-in-your-mouth old fashioned “Corn & Candy Station”. 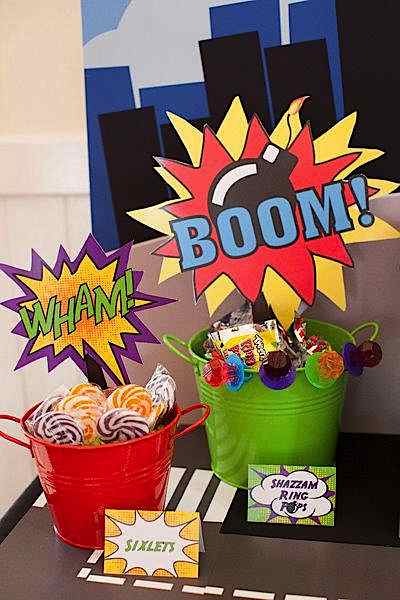 Opposite the popcorn & fairy floss was the Boom, Wham” and POW Superhero table (styled by Sophisticated Yum). 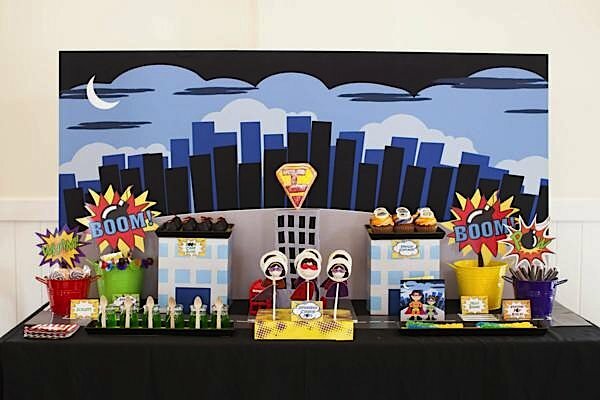 This cool-looking table featured a custom made backdrop to match the invitations (by Tiny Tots Toy Hire), ‘shazzam rings’, mini bomb cake bites, lollies in colourful tin buckets, personalised vanilla cupcakes and cookie pops to match the boy and girl Superheroes featured on the invitation. 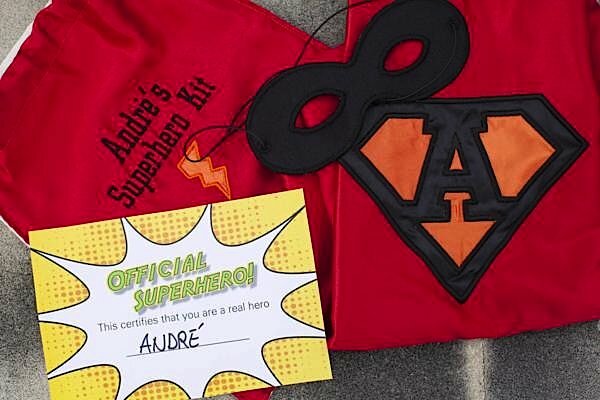 Keeping with the Superhero theme, custom made Superhero Kits including a personalised cape, mask and Official Superhero certificate were provided for all the kids, with the babies getting their own custom made bibs! Guests also enjoyed their own healthy superhero themed lunchboxes. 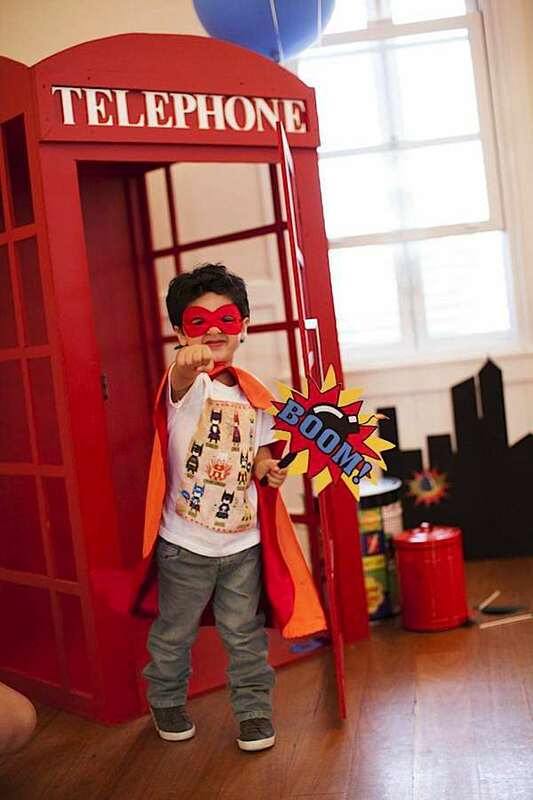 The custom made phone booth was the perfect prop for parents to snap away fun memories of their little superheroes. 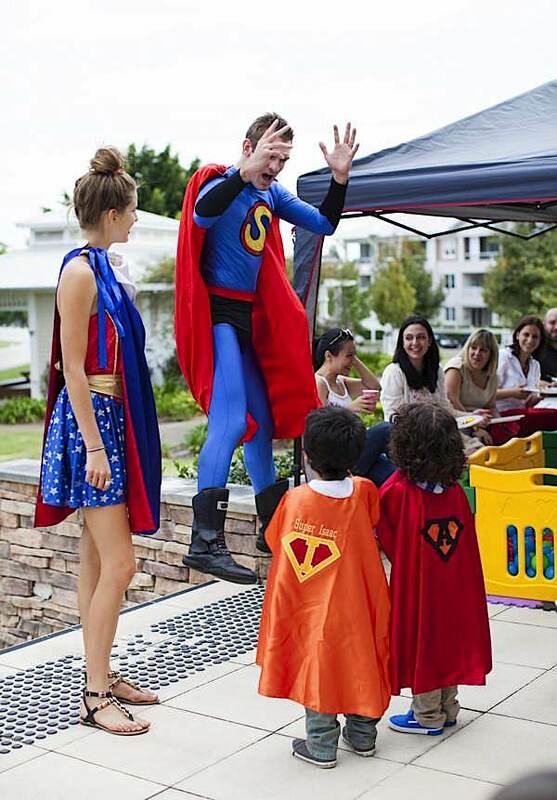 Not to mention the two real life Superhero entertainers who made a surprise visit to help the kids complete their mission of saving the Milk Bar (as per the party invitation). The kids had such a great time! Nothing beats the look on their faces when Super Trev and his accomplice showed up running towards them across the lawn! Well maybe that look was beaten by the look on the mums’ faces when the kids used magic powers on the dads to make them dance like ballerinas! said Dalia. Growing up, I always loved super hero’s. I remember having a super hero birthday when I was young and it wasn’t anything like this one but it was still my favorite! GREAT JOB GUYS! 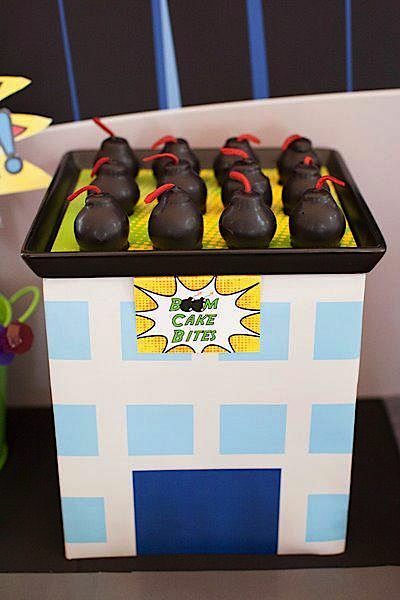 Love the idea of the boom cake bites and cookie pops! I see this party in my son’s future as well! Where did you purchase the coloured tin buckets? 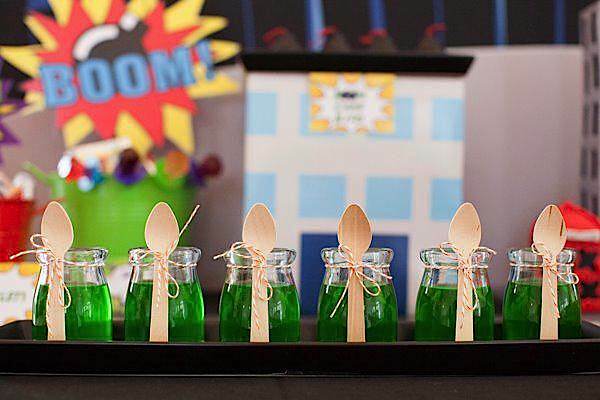 SUPER CUTE PARTY – YOU REALLY NAILED IT! 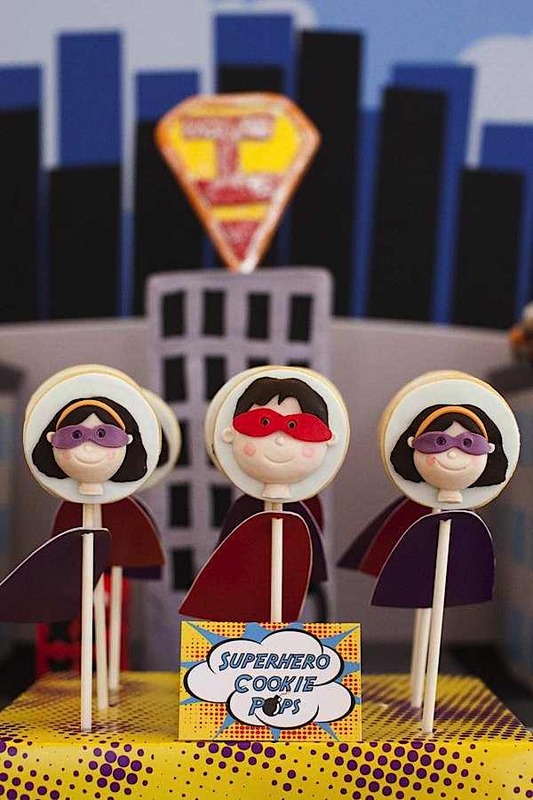 LOVE THE SUPER HERO COOKIE POPS. Magnificent goods from you, man. I’ve understand your stuff previous to and you’re just extremely great. I actually like what you have acquired here, certainly like what you are stating and the way in which you say it. You make it entertaining and you still care for to keep it wise. I can’t wait to read much more from you. This is actually a tremendous website.